What to make of Notre Dame's amazing performance over Utah? 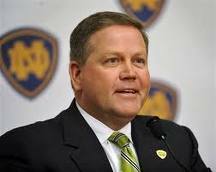 Well for starters it was by far the most important victory so far for Brian Kelly. We may look back on it in years to come as his defining moment. It will quell the doubters, who were out in force after the Tulsa match and give him valuable breathing space. It was also the kind of victory that will be seen as a defining moment for this team and coach. "You saw it today was a football team that didn't have on their shoulders the traditions and reputations and all the things that you have to worry about sometimes being a football player at Notre Dame, and they just flat out played." Flat out played they did and without many of the stars that have been injured in the past few weeks. 18-year-old quarterback Tommy Rees, only the ninth true freshman quarterback to start since 1951 looked wise beyond his years, never looked likely to throw an interception and threw three touchdown passes that mark him as the favorite to be next year's starter, Dayne Crist or no Dayne Crist. But it was the same throughout the entire team, as if a light switch had suddenly turned on and the team suddenly got it. Let's hope it is not wasted with a poor effort against Army next week. The letdown of Navy after the Pittsburgh win is still fresh in all our minds and the inabiity to stop the wishbone attack. But for now let's savor the moment. Utah have been banished and the Fighting Irish are within a game of a bowl berth, neither of which looked remotely possible after the Tulsa debacle.